We love these old Soviet-era "Behind the Iron Curtain" guitars here on Guitarz. I've said before I can't understand why so many bassists stick with the no doubtedly trusty, but unadventurous, Fender Precision Bass when there are so many other fantastic basses - old and new - to consider. I have a couple of 1960s basses in my arsenal and have recorded with them with no problems whatsoever. OK, I appreciate that certain vintage basses, particularly short-scale instruments, don't provide very modern punchy bass tones, but why follow the herd and use the same sounds as everyone else anyway? I don't know what people are so scared of. 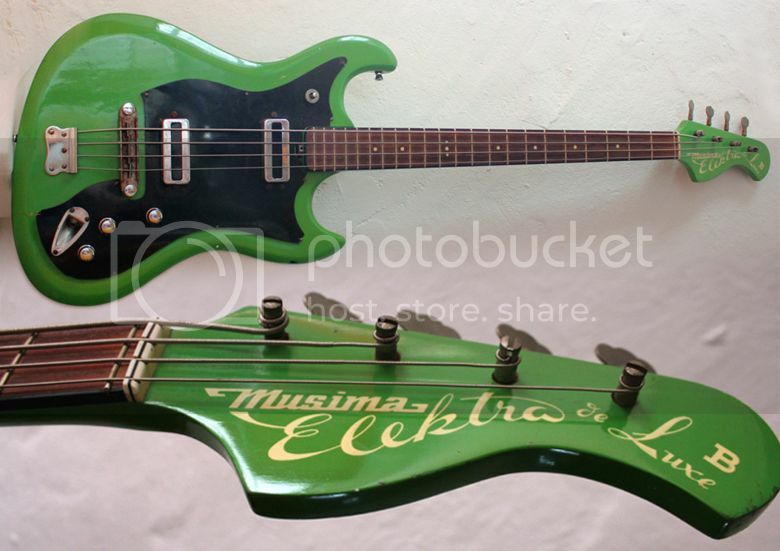 This particular bass in "frog green" finish (as the seller calls it) is a Musima Elektra De luxe B Bass and is currently being offered for sale on eBay UK for what seems to me like a totally reasonable price of £189. When they show music festival footage on the TV I play spot the bass that isn't a Pbass game. It's got to be 9 out of 10 bassist play them and that's in all different genres of music too. A remarkable feat for what is really a pretty simple and humble instrument. Sounds like a great game! At least 'one' aspect of every performance will be interesting? Never understood the "modern punchy bass tones" thing myself. An excellent example we've all heard is Tommy Shannon's bass line to SRV's "Texas Flood" where the bass is ( as I prefer ) "felt, not heard"! And why have a 'bass' playing in a higher register than can be produced by a guitar? That is pretty damn fantastic.